Spending an evening with the St. Paul Saints Baseball has become an essential part of a Minnesota summer or at times the middle of winter. The Northern League team is known as much for its baseball hauling pigs, and creative and quirky promotions, as the team on the field. The Saints are also the only place to see outdoor professional baseball in the metro area (at least until next year). Throughout the 2009 season mnartists.org is partnering with the St. Paul Saints for a very unique promotion, pairing art with baseball. The project is in honor of local artist Andy Nelson who came to the Saints during the winter of 1993 and offered to do artwork for the team. Throughout the following years Andy painted murals throughout the stadium, produced artwork for promotional materials, and become a beloved part of the organization. Andy sadly passed away during the this off-season. 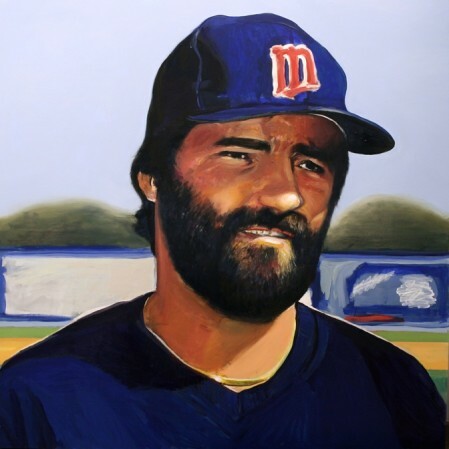 In remembrance of Andy, of whom team president Mike Veeck calls “our muse”, the Saints are partnering with mnartists.org and the Minnesota Art community. Beginning with the May 19th opener the St. Paul Saints will feature one Minnesota artist for each home game. The “artist of the game” will be introduced on the field as images of their work scroll on the scoreboard. In addition, each featured artist is generously donating a piece to be displayed within the mnartists.org gallery located near the third base stands. During the game a silent auction will be held for the donated piece with proceeds going to local art education non-profits. The artist is also featured on a limited edition baseball card available at the game, which is sure to become a very desirable collectible in its own right. Okay, so I think it was 1967 or 1968 and I was 6 or 7 years old. That summer I played little league in the big southern Minnesota city of Waseca. My team had the brightest, ugly yellow uniforms the world had ever seen. 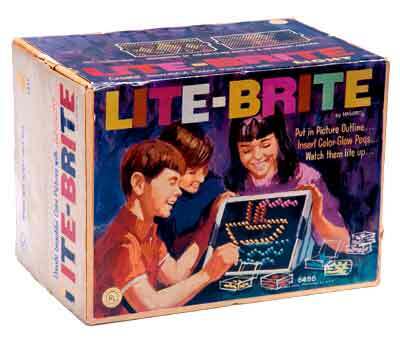 So bright, that we were nicknamed the Light Brites. I played outfield, and rarely played well with any consistency. I had no sense of team sports at this age. I told my mom I wanted to quit baseball. My favorite baseball memory was my first Cubs game when I was 4 years old. My grandparents took me to a Cubs game at Wrigley field and I remember getting out of the car walking down the street under the ‘EL” tracks the park. I don’t remember too much about the game, but I know we sat in the first row of the upper deck on the 3rd base side in the middle of the outfield. I spent allot of the game leaning over the railing and staring at the black, white and yellow “Torco” advertisement on top of one of the buildings on Sheffield Ave. The thing I always laugh about is apparently I didn’t really understand the game because at one point I remember turning to my grandparents and asking why they didn’t put the dirt part in the middle of the park so everyone could see better. In 1989, when I was older and understood baseball better, I also quite fondly and vividly remember sitting in my parent’s basement and watching the Cubs clinch the Eastern Division against the Montreal Expos. Shortly after that the cubs were destroyed by the Giants and I began wildly crying because the season was over and the cubs didn’t go any further. My mom had to come down and tell me that there was “always next year” and things like that. That was the start of many disappointing seasons of being a Cubs fan. Twenty years later, it hasn’t gotten any easier. You would think I have learned by now. And by the way, the only curse that exists, is that of being a cubs fan. no billy goats or black cats…us Cubs fans place the curse upon us – the curse that keeps on giving. I will never forget the parade downtown Minneapolis in 1991 when the Twins won their second World Series. The entire city was there. I skipped school to madly wave my homer hanky as Dan Galdden passed by. It was the summer before eighth grade and I had never played baseball in my life, mainly because of lack of talent. My mother signed me up on a team because we had just moved and thought it would be a great way to meet friends. I was practicing with the team and playing right field as the coach hit balls to the players for a defensive drill. He cracked a pop fly out to me and I lost the ball in the sun and then–very quickly–the ball knocked my two front teeth out onto the grass; at first I was in shock about what had happened and thought the two long pieces of enamel-coated cementum were parts of my brain. But after putting my glasses on and feeling my mouth I realized what had happened. It took what seemed like an eternity for the coach to have my mother pick me up because I couldn’t really talk to tell him my phone number. Fortunately, when my mother arrived my little brother knew to put the teeth in milk, and after some emergency dental surgery, my Swedish dentist was able to salvage my smile. Needless to say, I never played baseball again. Growing up in New York City my sportiness was limited to gym class where we learned poplar “sports” like kickball & dodge ball. My friend invited me to come to the park with her family to play a game of baseball. They explained the rules to me…including that you could tag out a player. So I got the ball and threw it at the runner…. dodge ball style… I hit him in the back and everyone laughed….. that’s how I learned the difference between baseball and kickball….. The first essay, and second piece of writing, I ever published was about baseball. (The first piece, oddly, was a short fictional tale about a beekeeper’s nephew, but that’s another story.) The essay was about Steve Garvey, the All Star First Baseman for the L.A. Dodgers during my childhood growing up in Southern California. This was a long time ago. 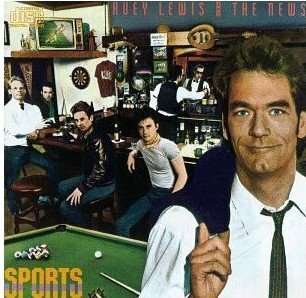 Sports heroes in the 1970s, even in the wake of Jim Bouton’s Ball Four, were still not fully understood to be human beings, with flaws and warts and character defects and so on. As a nine-year-old member of the Steve Garvey Fan Club, I was ignorant of cocaine and barbiturates (the scourge of the 70s), and I had no idea that the scourge of the 90s and 00s would be a different kind of drug, and I most certainly did not know about out-of-wedlock children. Well, actually I did know about that last thing, having been one myself, but I never would have expected Steve Garvey, my hero, would be revealed, after his playing days, as a deadbeat-dad-slash-adulterer not just once over but twice simultaneously with two different women who were not his lovely and popular wife (and early Regis Philben co-host), Cyndy Garvey. (True story.) Even worse perhaps, the guy bolted from my beloved Dodgers in 1982, eventually leading the cross-state rival Padres to its only World Series (at the time) in 1984. Garvey left behind, as his hapless replacement, Greg You-Gotta-Be-Kidding-Me Brock , a guy I once saw make two errors on routine plays in a single inning! And this was all because apparently Garvey wanted more money (probably to pay for all his future paternity suits, when it comes down to it). As you can see, it was inevitable I’d turn the eye-opening truths about adulthood that I learned from my boyhood hero into a disheartening come-of-age welcome-to-the-real-world musing that would be published in a small literary journal called Mosaic. And if you’re wondering why a 23-year-old, nascent essayist on baseball ended up becoming, some years later, a writer on art (with several hundred publications to his credit; so many publications, in fact, that I couldn’t find a copy of my essay on Steve Garvey, buried as it is under too much muck and old newsprint I’ve saved), I think it all comes down to that flawed human thing. I wrote about baseball then, just as I write today about art, because it is the imperfection of our athletes and artists, and the struggle of both to rise above our own natures, that interests me. Or else it has something to do with the 19th-century yeoman roots of both, but that’s another story. “Stuck in Right Field” – a celebration of art and baseball and whatever intersections there may be between the two. Where: The plastic confines of the Metrodome. When: Wednesday, June 3. Game time, 7:10 pm. How: Artsy sorts are asked meet up at the main Twins Ticket Office – near Gate G – no later than 6:20 pm. (!!!!!) (Be there on time, or miss your chance to sit with the gang!) Everyone will pitch in to buy general admission tickets for themselves (for cheap! – only $8), and we will all enjoy Hormel Dollar Dog night together. And out in the fabulous Right Field Nose Bleeds! And for those of you eager to catch your favorite local artist out at the Saints game this summer….here is the full lineup of featured artists. Play Ball!